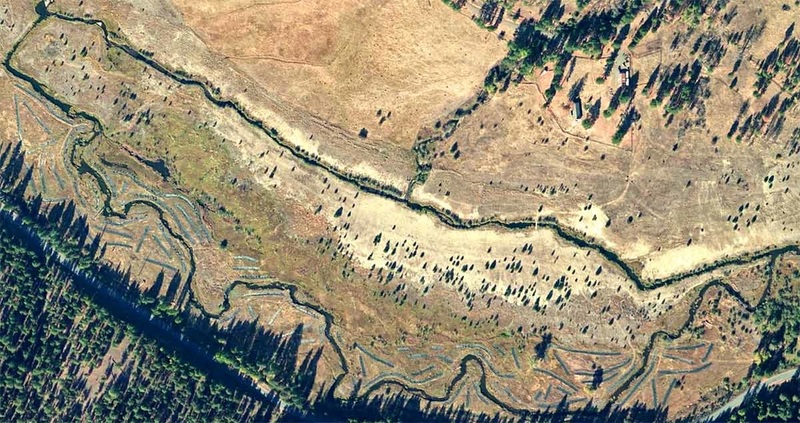 As Euroamericans settled the Middle Fork and began to use the land for grazing, agriculture and mining activities, they often artificially straightened the river channel or pushed it against the toe of the hillside to make more room in the floodplain. To keep the now-straight river confined, settlers used levees, rock barbs, riprap, or other artificial structures to prevent the river from leaving its channel or migrating back and forth. But straightening and confining the river had consequences: As flows of nutrients, sediment, wood and gravel from floodplain to river stopped or slowed through loss of lateral (side-to-side) connectivity, the river’s ability to nourish new generations of fish and wildlife became impoverished. By contrast, a stream with more curves and meanders in it helps slow down fast-moving floodwaters, reducing erosion and cooling the water by forcing more of it to flow through gravel bars. Channel reconfiguration projects aim to reverse this historical straightening and confining, and reconnect the river with its floodplain, giving it back its old freedom to meander. These projects include channel realignment, reconnecting the existing channel to old meanders, removing artificial structures, and pulling back levees and/or roads. Removal of artificial structures combined with restoration of riparian vegetation may allow the stream to form a narrower and deeper channel reducing stream temperature. Because floodplains can act like sponges, increased river connection to the floodplain may result in longer water storage throughout the summer from spring run-off. In the summer of 2006, The Freshwater Trust, US Forest Service and partners launched the Middle Fork John Day River (MFJDR) Channel Relocation and Riparian Restoration Project, a multi-phase effort to increase stream length and complexity, restore natural floodplain and meadow function, and restore riparian habitat along 3.8 miles of the Middle Fork of the John Day River. During the early and mid-1900s, this stretch of river was straightened and diked in order to drain wet meadow floodplain habitat and create livestock pasture. This resulted in a higher stream energy system with reduced habitat diversity. 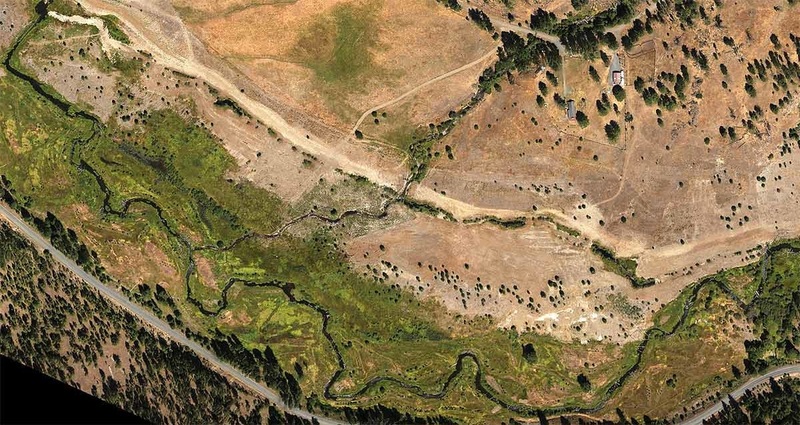 By reconnecting the straightened river to its remnant historic channel and replanting the riparian area, the project sought to restore normal stream and riparian form and function to benefit spring Chinook and summer steelhead. On-the-ground work began in summer 2009 and was completed in 2010.